research it well. When writing entertainment articles, it?s often acceptable to be a critic as well. Locate 3 entertainment features/articles and list their sources. Identify what the 3 entertainment articles are about. Are the questions who, what, when, and where, answered (if appropriate) ? How does the headline draw your attention to the article? Does the lead address a review of the entertainment and provide the writer?s opinion? Is the writer?s opinion clearly backed up with reasons? How does the writing convey praise or criticism for the review/article? 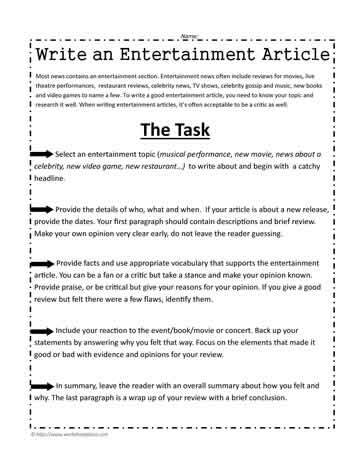 In your opinion, is this entertainment article effective? Why or why not? How did the writer influence you? Is there anything that could be improved upon in this sports article?